Earlier this year, I was in Minneapolis to see Andrea Davis Pinkney speak at the University of Minnesota. While I was there, I was lucky enough to run into Coe Booth. I knew of her books, but hadn’t read them yet. We chatted about her newest book set to be released around the beginning of the school year, Kinda Like Brothers. I enjoyed chatting with her, so when I got home, I tracked down all three of her published books. I loved getting to know Tyrell and Kendra. If you haven’t met them yet, you’re missing out. 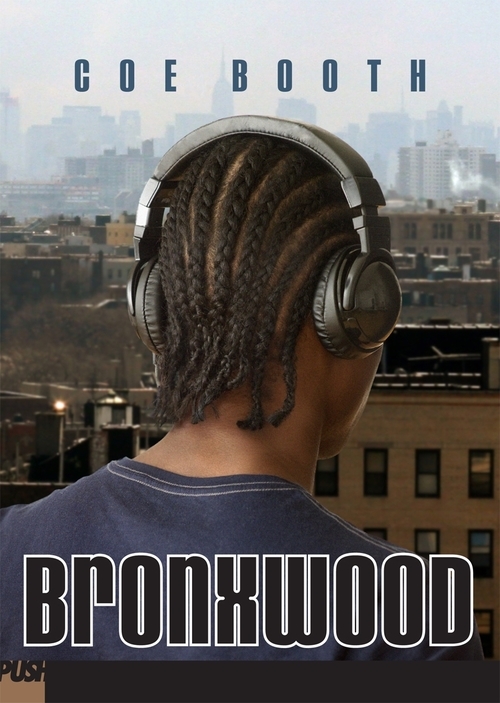 Goodreads summary: Tyrell is a young, African American teen who can’t get a break. He’s living (for now) with his spaced-out mother and little brother in a homeless shelter. His father’s in jail. His girlfriend supports him, but he doesn’t feel good enough for her – and seems to be always on the verge of doing the wrong thing around her. There’s another girl at the homeless shelter who is also after him, although the desires there are complicated. Tyrell feels he needs to score some money to make things better. Will he end up following in his father’s footsteps? 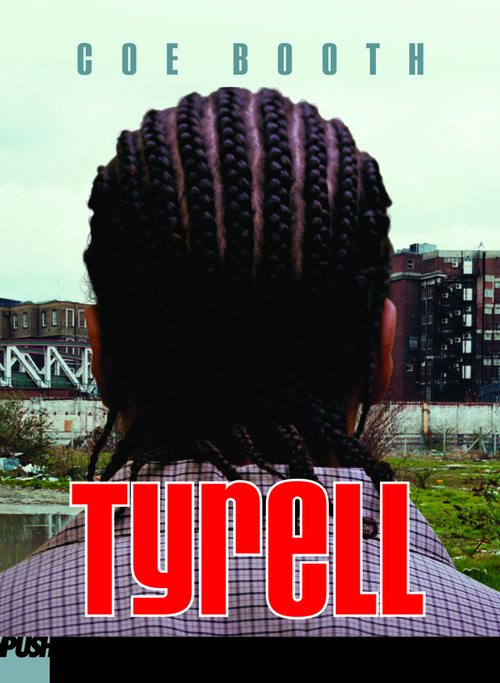 My thoughts: Tyrell is a very well written book that kept stomping on my heart. Tyrell doesn’t always make the choices that I wish for him, but I understood why he was doing what he was doing. Booth lets the reader know him so well through his thoughts and actions. He is a kid trying to be a man he can respect and he isn’t getting a lot of help from the adults around him. I found it difficult to read because it just ripped up my heart watching things go from bad to worse. The choices he has to make and the situations he faces are just so far beyond what I would want teenagers to go through. Of course, as soon as I was finished, I wanted the next book so I could see him grow. Goodreads summary: Tyrell’s father is just out of jail, and Tyrell doesn’t know how to deal with that. It’s bad enough that his brother Troy is in foster care and that his mother is no help whatsoever. Now there’s another thing up in his face, just when he’s trying to settle down. Tyrell’s father has plans of his own, and doesn’t seem to care whether or not Tyrell wants to go along with them. Tyrell can see the crash that’s coming — with his dad, with the rest of his family, with the girls he’s seeing — but he’s not sure he can stop it. Or if he even wants to. My thoughts: Once again, Coe Booth made me care about this young man. Tyrell’s heart is in the right place as he struggles to parent himself and his brother since their parents have often been unwilling or unable to do the job. This is one of the major issues in the book. When a young person has to take on so much responsibility, it’s very hard to step back into the role of a child. Tyrell straddles that line between childhood and adulthood and he’s unsteady on his feet, stumbling around quite a bit. Balancing becomes even more of a challenge when his father actually starts to step back into a parental role. I would love to see another book in this series. Goodreads summary: Kendra’s mom, Renee, had her when she was only 14 years old. Renee and her mom made a deal — Renee could get an education, and Kendra would live with her grandmother. But now Renee’s out of grad school and Kendra’s in high school … and getting into some trouble herself. Kendra’s grandmother lays down the law: It’s time for Renee to take care of her daughter. Kendra wants this badly — even though Renee keeps disappointing her. Being a mother isn’t easy, but being a daughter can be just as hard. Now it’s up to Kendra and Renee to make it work. My thoughts: Kendra is a companion book to Tyrell. I didn’t realize that until I got into the story. Kendra lives in the same neighborhood. Like Tyrell, Kendra deals with very adult situations. What I like about the books is that the characters are so real. They have hard decisions to make and they don’t always take the path that I, as a mother, would choose for them. The choices they make though, make sense seen through their eyes and emotions. Booth lets us in there up close and personal. Her books are not easy to read lightly. What’s New – Having read these three books, I had to wonder about the coming middle grade novel especially since I teach elementary school students. Coe Booth did not sugar coat things in her young adult novels. She put everything out there. Tyrell and those around him use some very colorful language and several of the topics covered were very definitely teen or adult. 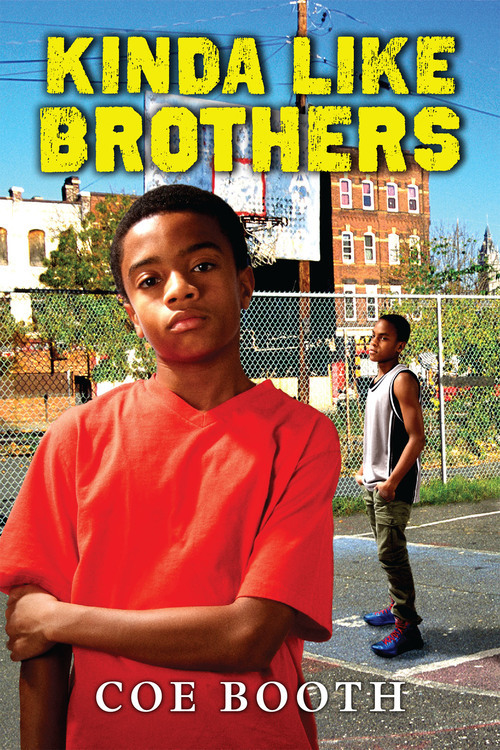 In Kinda Like Brothers, Booth still provided realistic characters and situations, but without cursing or mature content. It fits since Jarrett’s mother would never put up with such language and though there are difficult situations, there are also caring adults around. Goodreads summary: Jarrett doesn’t trust Kevon. But he’s got to share a room with him anyway. It was one thing when Jarrett’s mom took care of foster babies who needed help. But this time it’s different. This time the baby who needs help has an older brother — a kid Jarrett’s age named Kevon. Everyone thinks Jarrett and Kevon should be friends — but that’s not gonna happen. Not when Kevon’s acting like he’s better than Jarrett — and not when Jarrett finds out Kevon’s keeping some major secrets. Jarrett doesn’t think it’s fair that he has to share his room, his friends, and his life with some stranger. He’s gotta do something about it — but what? My thoughts: [a review copy was provided by the publisher] Coe Booth crafted a unique story here and again made the characters matter to me. I’ve run across quite a few stories about foster children, but this was one of the only times I remember a book that looks at it from the foster family perspective. Jarrett knows all about not getting too attached to the babies that come and go. Having an older foster brother is new though, and is way more difficult. Sharing a room, his friends, and especially his mom, wears him down. Jarrett also has some troubles with school and has a shady habit of spying and eavesdropping. I was rooting for him even when I was groaning at some of his actions. To hear a little bit about the book, check out the NPR interview. In it, Booth is asked about one of the scenes in the book that especially stood out to me – when Jarrett witnesses a counselor at the community center getting frisked by the police. There is discussion about the fact that Jarrett and the other children at the center will likely experience the same situation because of their skin color. While this isn’t the focus of the book, it certainly gives the reader much to think about. Coe Booth is a master of realistic fiction and I look forward to reading more of her novels be they young adult, middle grade or any other age she may take on next. 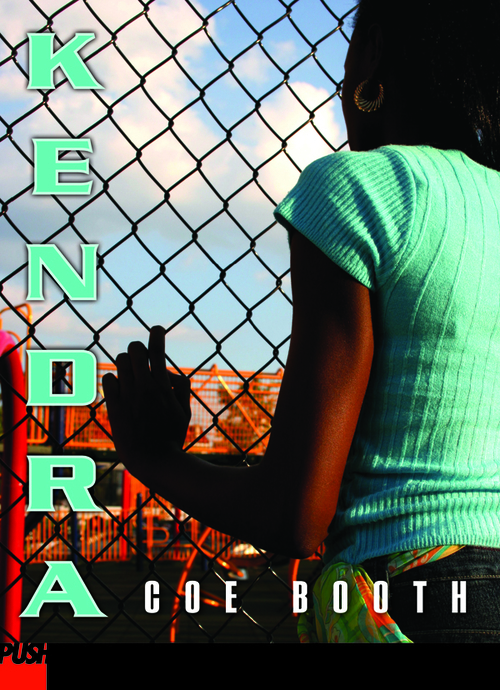 I love Coe’s books and am especially impressed with how she made the transition from gritty YA novels to a sweet and inspiring, yet still realistic, MG. She was one of my advisors at Vermont College of Fine Arts and I consider myself fortunate to have had the opportunity to work with her and learn from her. Yes! I too am impressed with the transition. What a treat to be able to work with her.